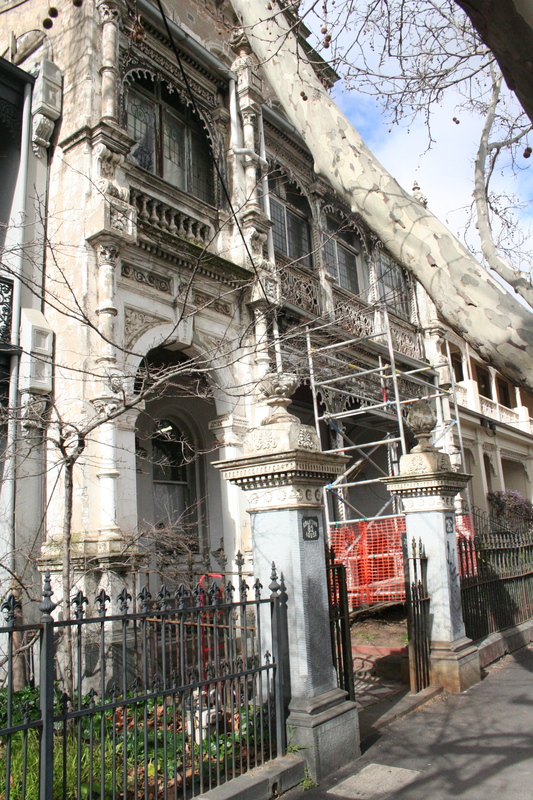 Close together in Nicholson Street, Fitzroy, are two intriguing constructions that could hardly be more different. Stylistically and philosophically they are at opposite ends of a spectrum, but they are both worth a visit. 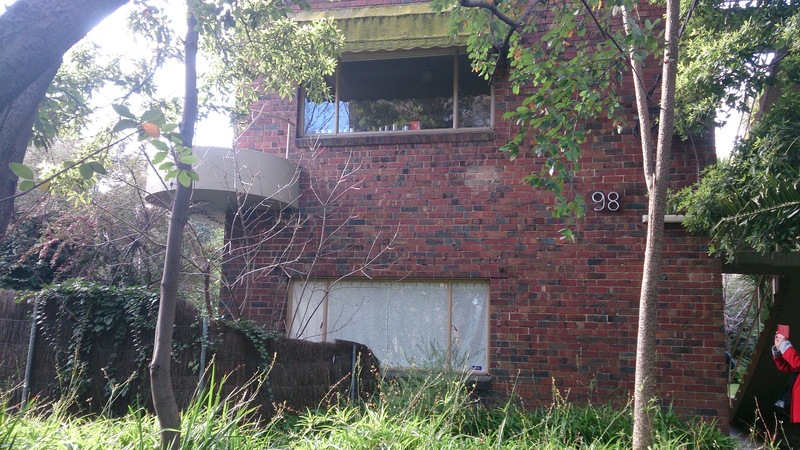 First up, the Cairo flats at 98 Nicholson Street. 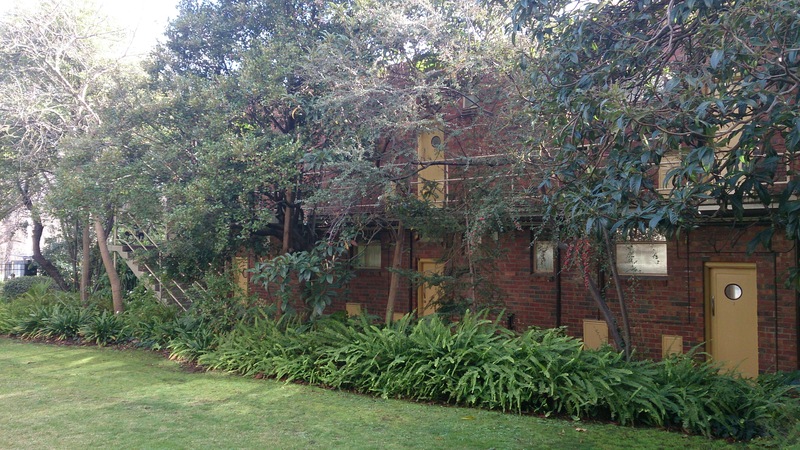 These apartments, built in 1936 and designed by Best Overend, were the first appearance of modernism in the context of apartment living in Australia. Like Frederick Romberg who designed the ETA factory (which I walked past in Braybrook a few weeks ago) Overend was one of the architects who brought modernism to Melbourne. He’d spent time in London where he’d worked with an influential Canadian architect, Wells Coates, before returning to his home town, becoming a vocal advocate of modernism. It was all about clean lines, functionalism, no unnecessary decoration. A house is a machine for living in, and all that. 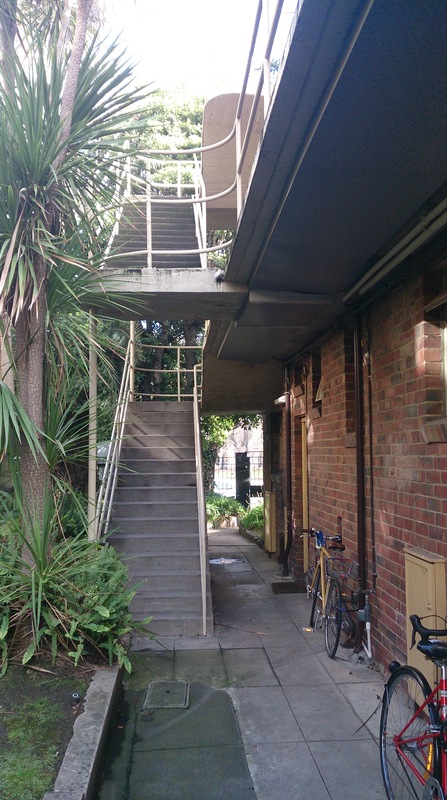 The Cairo flats were designed as small apartments for single people – ‘bachelor flats’ as the terminology of the time had it – with a shared garden area. 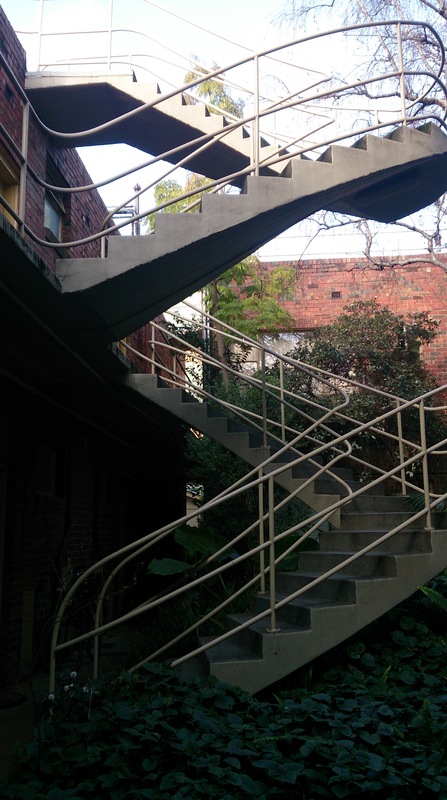 They are noted for their ‘heroic use of concrete’, evident in the brilliant cantilever staircase that spirals out from the wall like a sculpture. Apparently when the staircase was unveiled, members of the Melbourne press corps showed up fully expecting it to fall down, due to the lack of external supports. 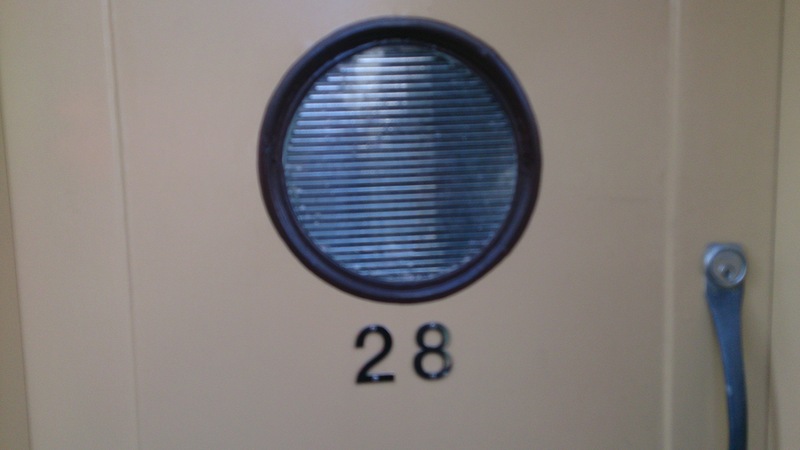 Other modernist features are the use of tubular metal railings, and the porthole-like windows on the doors, reminiscent of an ocean liner. All the windows face north, ensuring that they get plenty of sun, and the flats are secluded from Nicholson Street by railings and trees. 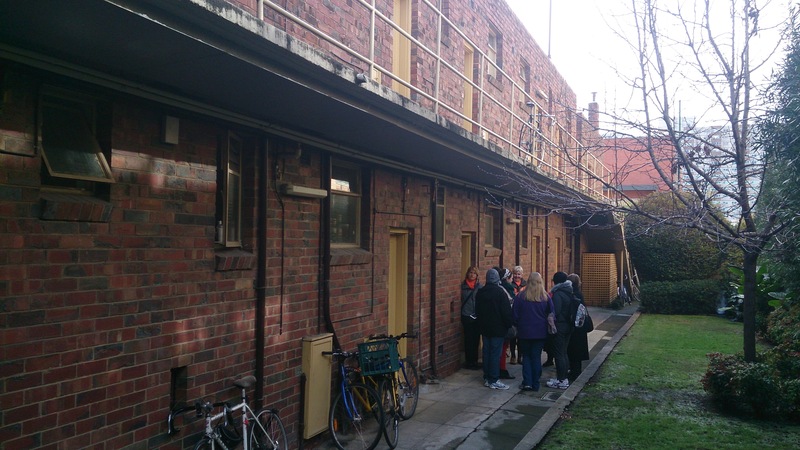 The Cairo flats are not usually open to the public but we got in for a look around during the recent Open House Melbourne. Inside, the apartments are pretty small – you can own a cat, but not swing one – but I dare say they are no smaller than the millions of crappy apartments being built in towers around the city today, and these have the advantage of sunlight and access to a shared garden. If you want to read more about the Cairo flats (and the theft of a Picasso from the National Gallery) you might like Chris Womersley’s novel, Cairo. In contrast, a bit further along Nicholson Street is a very different building, Grantown House. This is a crazy old three-storey mansion that embodies the worst (or best, depending on your point of view) excesses of the Victorian era. (Maybe Best Overend used to hurry past, averting his pure modernist eyes, on his way to Cairo). It looks like a prop from a corny horror movie, and given the shape it is in it is quite amazing that it hasn’t been pulled down – but I’m glad it hasn’t. 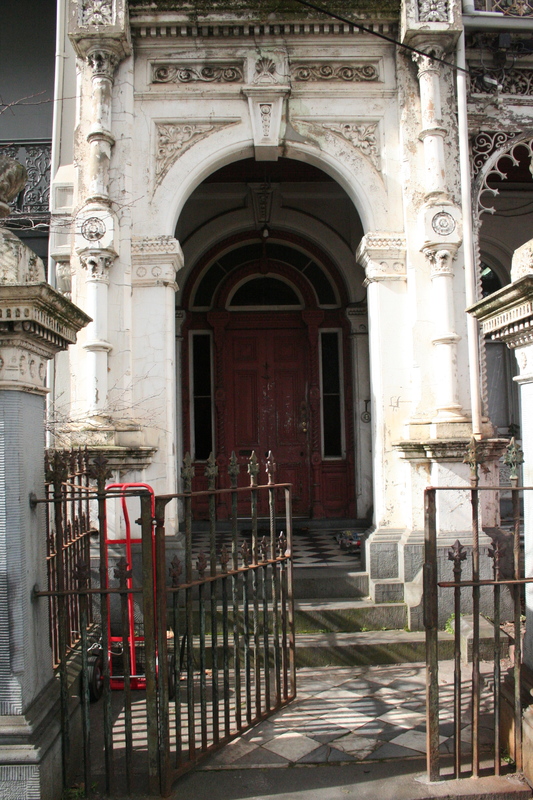 It has a kind of triumphant, decayed splendour all of its own. 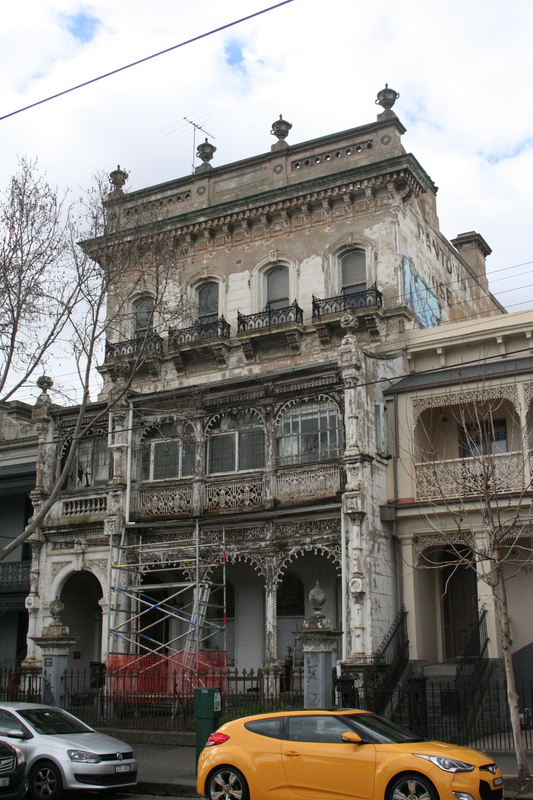 There are many more impressive edifices in this neighbourhood – the Royal Exhibition Building is just across the road, which is a bit too grand for Melbourne Circle – but Grantown House is one of my favourite bits of Victoriana in Melbourne. Whatever else it is, it’s not a machine for living in. It’s all about demonstrating wealth and status, and standing out as much as possible from the crowd. Check out the oceans of cast iron, the balconies, the lavish ornament, and those little windows behind which you can picture mad Dickensian heroines pining away their lives in rooms festooned with spiders’ webs. No doubt one could find out the real history of Grantown house easily enough but I’d rather imagine narratives combining the inevitable elements of Victorian fiction: a grasping miser, unexpected wealth/poverty, love affairs gone wrong, sudden death, somebody mad in the attic, and a ghost or two. It’s all happened behind those decayed balconies, I’m sure of it. The doorway beckons you in to what unknown fate? The scaffolding suggests that someone is doing some renovations, but a complete overhaul of the place would surely be very expensive. Hi Nick, due to the long time between posts I had an awful thought that you had abandoned your mission to complete the walk. Thankfully I was wrong and you continue to charm us with descriptions of what you have observed. Thank you for another wonderful journey around Melbourne. I can’t help thinking what a marvellous metropolis this city of ours is, long may she reign glorious. Hi Eddie, never fear, I was out of action (and out of town) for a while but I am back on the case now and have every intention of completing the walk. Thanks for reading! 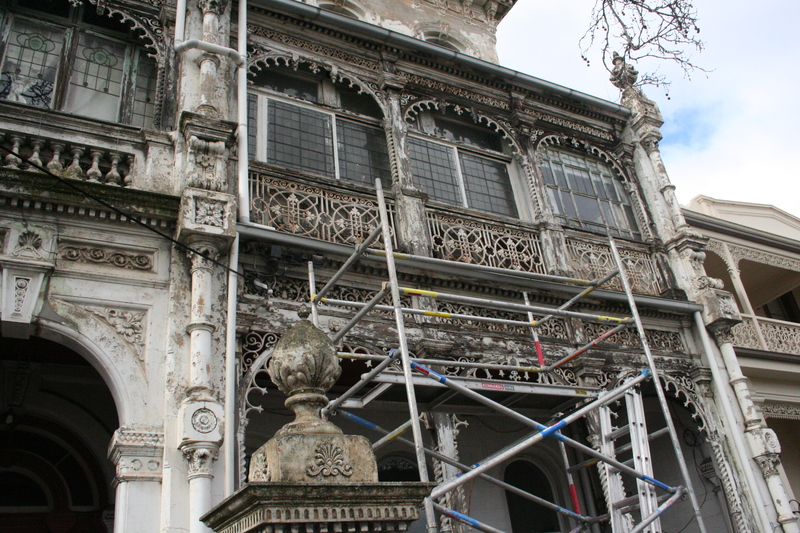 I love that spooky house, it does seem to emanate stories with its fantastic grimy, iron lace/cobwebbed appearance. Great post as always! This is such a coincidence. I lived in Cairo in the sixties not realising that just up the street my great great uncle had lived in Grantown House in the late 1890’s. I had totally forgotten about Cairo until I was walking up Nicholson Street last year, searching for Grantown House (a genealogy project) when I saw, through the ivy, the name plate – and it all came flooding back. Cairo had a lovely garden then and though I was in residence for only a few months, I loved living there. Yes, quite a coincidence! Thank you for the comment.